Today, iam8bit announced that it will release an exclusive PlayStation 4 physical edition of the puzzle game Donut County alongside an vinyl soundtrack later this year. The game’s physical version will be limited at 5,000 copies with worldwide compatibility, while the vinyl will include a massive foldout jacket that houses two colored vinyl records. 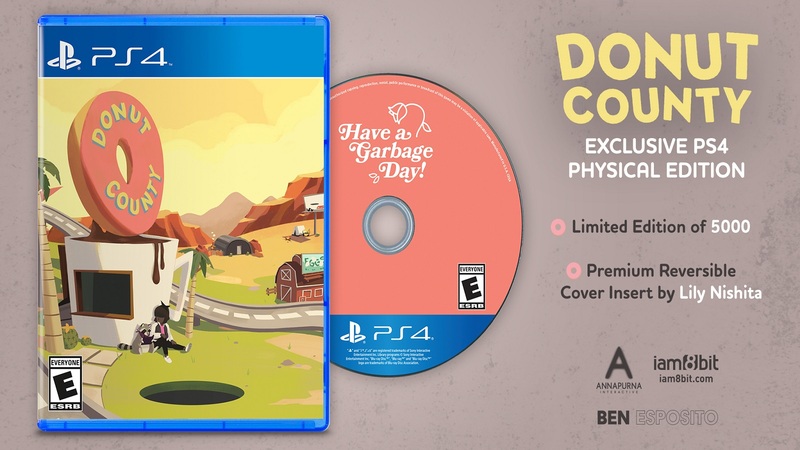 iam8bit will be releasing a PlayStation 4 physical version of the critically acclaimed Donut County, along with the game’s vinyl soundtrack later this year (both are available for pre-order now at the iam8bit store). Developed by Ben Esposito and published by Annapurna Interactive, the story-based physics puzzle game about a mysterious hole in the ground has been praised for its clever storytelling around deeper themes of gentrification – and now’s the chance for fans to chill out with the vinyl soundtrack or get their hands on one of the exclusive 5,000 physical copies that will be available worldwide. You haven’t heard the hole story until you take this delectable vinyl for a spin. Get a taste of Donut County’s lazy summer vibes with a sprawling soundtrack featuring Daniel Koestner’s instrumental ukulele hip hop and Ben Esposito’s ‘raccoon house music’. Scientifically proven* to trigger feelings of euphoria. Check out Abram’s glowing review of Donut County, and stay tuned for more news here on Gaming Trend.